Front row: Kerr Inkson, Harry O�Neill, Donnie Ross, Duncan Murray. Thanks for your comments. As you can see, I've made the necessary changes. 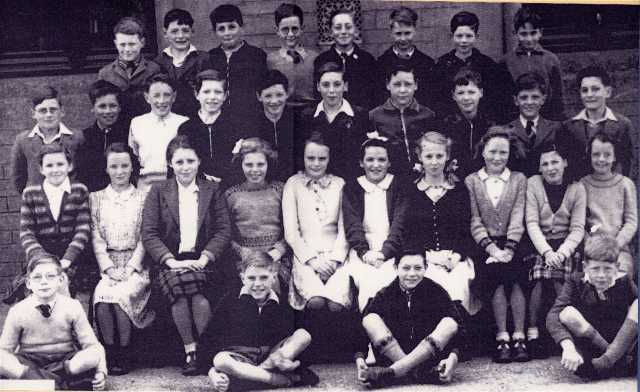 Kerr Inkson front row on left, left Invergordon Academy in 1952..was supposed to go into the qualifying class with Miss Macdonald (gogglie) and we did not know where he went...him and I were good pals...I did not find out where he went until Christmas of 2002 when he contacted me via e-mail...and I was flabbergasted when he told me he only moved to Dingwall, our paths never crossed in all that time...Kerr has really done us proud, he is now a Professor at Massey University in New Zealand. Hi - could any one tell me if the JOHN ROSS in this photo is the John that was killed in a car crash at the end of the High Street? My name is also John Ross - his nephew if it's the right one. John, the John Ross in the picture had a nickname Sconner; he lived at the east end of Joss St. He also had a brother with nickname of Podge who died a few years ago...don't know if it's the same one you refer to...if it is please let me know, thanks. Hi harry - this is not my uncle. The John I was on about lived in Barbaraville and had brothers Duncan, Robert (sob) and Graham (my father). Duncan Murray is a cousin of my Father and I believe he lives in Alness. He has a younger brother, Iain. Their father was also called Duncan. I remember John Ross, from barbaraville. He lived in the house at the T-junction leading to Delny Rhives etc. Great friend of mine, used to pal about a lot, me, him, Dougie Carron, Willy "Peam" Munro. Was devastated when heard he was killed as I was down here in Corby and did not hear till after the funeral. He came down to Corby with me in 1961 but went back home after a few months. Knew his kid brothers as well - where are they now ? Thanks for that John. I am comming up in July sometime, so will have search around. Still in contact with Alister Mclennen who now lives in High Street. Hi Daniel, you were wondering where John's brothers are now. Duncan is living near Inverness, Robert is living in Invergordon and Graham is living in Edderton near Tain. I was in school with Sandra Grant's daughter, Nicola Reid. They could be twins - they look exactly the same. I've only recently come to this site having been pointed to it by Jim Logan. However skimming through all the school photos there seems to be a couple of significant gaps. There doesn't seem to be any pictures of the class that was 2 ahead of mine i.e. the class that had Sandy Cooper, John Logan, Flora Ross; and another for the class 2 behind mine i.e. Mary Cooper would have been in that one. Was there a hiatus of about 4 years after 1955 when there were No school photos? I use the figure of 1955 because Jim Logan e-mailed me a picture of our class for that year. What is painful too is to read of those of my contemporaries who are no longer with us. Are those of us left just "lucky"? The other thing that strikes looking back from 40 years later is how radically different we look from 12/13/14 year olds of today, not just the clothes but our faces. I'll carry on browsing. Can anyone out there tell me if Sandra Reid nee Grant still lives in Inverg? We had some really good times together when she worked as usherette in the local fleapit and later worked at the bakery. I lived on Clyde Street. Kerr Inkson is now the Professor of Management at University of Auckland Business school. Looking at the photo in the website he doesn't look all that different (but then we've all stayed young and beautiful looking, haven't we? Or am I dreaming? Sandra Grant still lives in Invergordon. I see her and her daughter Nicola a lot - will pass on message. Don't think Sandra has internet but Nicola does. Thanks Margaret, that would be great, the last time we met was Oct 1965 when my eldest daughter was christened. We were living in Ireland at that time. Hi Jane, Harry, spoke to Sandra and told her about this site. She remembered you Jane - thought you became a nurse? At the time I hadn't seen your comment Harry but will pass on your regards as she does to Jane. As far as I know her sister Ishbel is in Aberdeen but will again tell Sandra and get her on the site!.... Sandra's mother passed away last year and Sandra told me there were a lot of old photos in her mother's house; she is going to look through them and put them on the site. Hi again Margaret, yes I was nursing in Ross Memorial and Invergordon County. Married 1963 (RAF) posted to Northern Ireland in '64 Malaysia '67 and then stationed various places in UK, finally settling in Cambrideshire. I have 3 children, 6 grandchildren, 2g/granchildren and another on the way!! Not so much a comment as a question. As there don't seem to be any school photos of the secondary classes does anyone know where Alan Drever is? I've seen his sister Judith post in here sometimes (I think) or, Donald Hugh Ross (younger son of our esteemed Latin teacher). I last saw AD fleetingly at an OU summerschool at Stirling Uni in 1976(?). Donald disappeared into journalism never to be heard of since (nor his older brother John Fraser Ross). If any one wishes to update me, can the site admin supply them with my email address (I'm happy for that). I lived at 16 Inglis Road but left Invergordon shortly after this photo was taken, and saw only a few of those in it ever again. But sixty-two years on, I can remember everyone, clear as day. Nowadays I live in Auckland, New Zealand, but I visit Invergordon every few years, and walk about, and remember. Donald Hugh, I remember you well. Are you still there? Any one know where Donnie Ross is now ? He used to live at Balintraid by the pier. Regret to advise that Charlie Collins, far right 2nd row has died.